Wives and Daughters by Elizabeth Gaskell was my Classics Club Spin book for March and April and I was rather daunted when I realised that the e-book version I had downloaded about six years ago has over 800 pages, but it’s really easy reading. It’s only the second book of hers that I’ve read – the other book is Cranford, but I think Wives and Daughters is so much better. 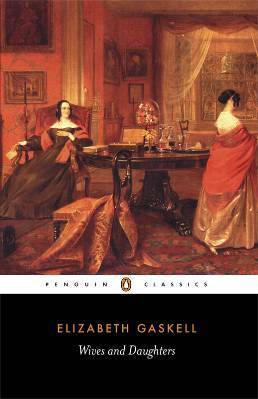 Elizabeth Gaskell is a superb storyteller and I loved this book. It is set in the late 1820s to the early 1830s in the village of Hollingford (based on Knutsford), a close-knit community much like Cranford, and centres around Molly Gibson, the only daughter of the neighbourhood doctor. The characters are all fully rounded and believable people, most certainly not perfect people with all their faults exposed through their dialogue and Elizabeth Gaskell’s ironic descriptions. There is gentle humour and the plot carries the novel at a fairly brisk pace despite the length of the book – I was eager to find out how everything was resolved. The story opens when Molly, an only child, is twelve and eagerly anticipating her visit to Cumnor Towers (based on Tatton Hall) for the yearly festivities hosted by Lady Cumnor and her daughters. But her enjoyment is spoiled when she gets lost in the house. She is found but then is overlooked when the carriages arrive to take all the visitors home and she has to wait for her father to come for her. This little episode provides an introduction to the other side of the village – the aristocracy. Molly is very close to her father. When she is seventeen the doctor becomes concerned that one of his pupils wanted to declare his feelings for her and so he sends her to stay with the local squire and his wife and two sons at Hamley Hall. Mrs Hamley becomes very fond of her and treats her like a daughter and Molly becomes very friendly with the second son Roger. However, she knows she isn’t considered a suitable match for the Hamleys and thinks of him and Osborne as her brothers. All is going well until Dr Gibson marries Hyacinth Clare (a former governess to Lord Cumner’s daughters), hoping she will be a mother to Molly. But Hyacinth is a selfish, socially ambitious and manipulative woman and Molly’s life is no longer happy and carefree, even though she does get on well with Hyacinth’s beautiful daughter, Cynthia. The two girls become good friends. Cynthia, though gets involved in a number of romantic entanglements which then gets Molly into trouble. I don’t want to go into more detail about the various sub-plots and romances other than to say I enjoyed it all immensely. The fact that Elizabeth Gaskell did not finish the book didn’t spoil the book at all for me. She had all but drawn all the threads together so that the editor’s concluding remarks coincided with the way I had hoped everything would be resolved. Needless to say really, but Molly was my favourite character, which says a lot about Elizabeth Gaskell’s skill and understanding in portraying a ‘good’ character. I was completely absorbed in the world that she had created. As well as being my Classics Club Spin book, Wives and Daughters is also one of my TBRs so it qualifies for Bev’s Mount TBR Reading Challenge. Oh man, I love this book! I had no idea when I first read it that it was unfinished… imagine my surprise when I turned the page and it was the end of the book with another 30 pages to go. I also love Molly and Roger and just all these characters. Have you seen the BBC miniseries from a few years back? I thought it was a very good version. Melwyk, no I missed the BBC miniseries completely!I’m glad though it was a good version as often TV versions change too much of the story. I have never read anything by Elizabeth Gaskell though she’s always been on my radar. Thanks for this review, Margaret. I think I would have been put off by the length of this book and you’ve encouraged me to look past that. It does sound like a delightful story, Margaret. I think I’d have been daunted by the length, too, but it sounds like one of those stories you can really sink into, if I can put it that way. Sounds like the spin worked out well for you! I tried a Gaskell years ago and didn’t really get on with it, but I think that was more to do with me reading it at the wrong time. Must try another sometime – this one sounds interesting, despite the 800 pages! I was pleasantly surprised at how “devour-able” this book was. I really flew through it and enjoyed it all. I hadn’t realised this one was unfinished though. Much as I loved North & South, I think W&D is Gaskell’s masterpiece. Molly is marvelous and the rest of the characters are so interesting and different from stereotype. I think Cynthia is fascinating, and then there’s Roger–one of the best heroes in literature. I love the way the various families interact, and village life and manor life mingle and separate. Placing Molly squarely between the two worlds was brilliant in my opinion. Glad you liked it. Cranford is comfortable but W&D is masterful.